The Jewish Identity Center's Holocaust Awareness Museum, America's first Holocaust museum, is 45 years young. 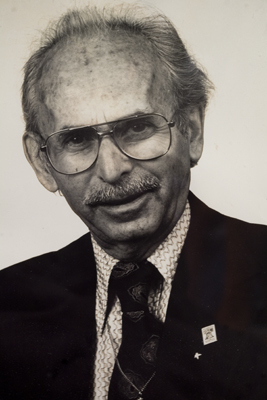 Yaakov Riz, the museum's founder, was a Holocaust survivor who lost 83 members of his family in Hitler's death camps. Riz vowed that if he survived he would dedicate his life to establishing a museum that would memorialize the millions of Jews and Non-Jews who perished at the hands of Nazi barbarism. Initially, the museum was housed in the basement of Riz's home. The museum's genesis, its growth and its struggle against intolerance are the realization of his dream, his courage and his commitment. Using the resources of the museum, our mission is to educate Delaware Valley students and adults, personalizing the Holocaust so that they learn the consequences of racism, ethnic cleansing, and intolerance. The Holocaust was a watershed event, not only in the 20th century, but in the entire history of humanity. The study of the Holocaust provides us with one of the most effective ways to work with students to examine basic moral issues and value systems. Survivor/Educator Presentations Our eyewitness testimonies program provides the opportunity for Holocaust survivors to tell their testimonies to public, private and parochial school students. A member of the Education Staff accompanies the survivor and facilitates a question and answer session during which students and teachers can personally ask the survivor or liberator questions and engage in a meaningful dialogue. These programs can be hosted at a school or at the museum and can be tailored to a degree to meet specific requests of teachers and facilitators. Anne Frank Theater Project This program consists of 45-60 minute live theater performances by professional actors. The performances highlight how ordinary families and teenagers were affected by the Nazis anti-Jewish legislations and the Final Solution. Following each performance a dialogue, led by an Education Staff member, takes place that focuses on tolerance, diversity, bullying, consequences, and cultural competence. Witness to History Project This program is for individual students and small classes and provides the opportunity for students to learn a particular survivor’s story and retell it to others. It includes help from a member of the Education Staff and coaching by a professional acting teacher. This program may serve as a class project or a Bar/Bat Mitvah project for young people who have an interest in Holocaust studies.